The Student Center is open free of charge to all Point Park University students. Faculty, staff and alumni must purchase a membership. Point Park ID is required for entry. Sunday 11 a.m. -11 p.m. Effective Monday 4/29/2019 through Sunday 8/11/2019. Normal hours of operation resume Monday 8/12/2019 at 7 a.m. The Student Center offers a new way to workout with your friends! Check out our Fitness on Demand studio located in room 207B. The Fitness on Demand studio features a touch screen console loaded with dozens of cardio, dance, strength training and yoga workouts from Daily Burn series and others. Select your workout and within seconds it will begin playing on a 70-inch screen. Bring a friend and get to work! Current Point Park students have full access to the Student Center and its programs free of charge. Point Park University faculty, staff and alumni may become a member of the Student Center and access all of its facilities and programs. Memberships will become invalid on the first day of the new month. Membership fees waived from 5/1/18 - 9/1-18. General Conditions of Use Waiver must still be completed. Please call 412-392-8024 for more information about Student Center memberships. 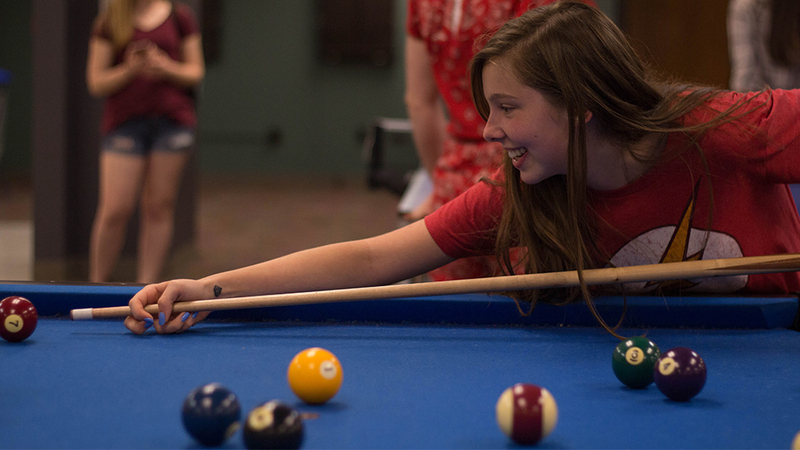 Complete with a lounge area with TVs, billiards, darts, foosball and table tennis, the second floor is the perfect place to unwind in between classes. Equipment is available to be checked out at the fourth floor desk. The fourth floor is home to our fitness center with a variety of equipment to meet your strength training and cardio workout needs. The fourth floor is also home to our racquetball court. Shoot some hoops with your friends! Basketballs are available to check out with your student ID at the fourth floor desk. Is the gym empty, or is the whole herd there? Find out whats going on in the Student Center with the FitDegree Student Center App. Just search "Point Park Student Center" in the Apple Appstore or Google Play. Facility is for current Point Park University Students, as well as faculty, staff and alumni that have purchased a membership. Guests are not permitted to utilize the facility. Failure to adhere to posted rules & instructions of staff members may result in a loss of privileges.